In early January 1942 Queen Mary arrived at Boston and entered the drydock for a thorough overhaul. Cunard had handed over the running of both Queens to the Americans at a recent Arcadia conference in Washington. This meant Cunard provided and paid the crews, which the UK government refunded. The UK government paid all fuel and running costs. The US government provided the troops and their food. 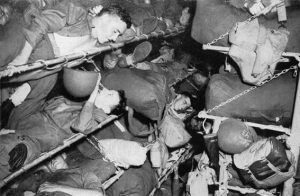 Accommodation aboard Queen Mary was increased again, with additional “standee” bunks crammed in wherever possible, and use made of “hot bunking” – as one soldier got up, another took his place. More kitchens and toilets were installed, with additional catering equipment, showers, etc. The armament was increased as well. Finally Queen Mary embarked her first contingent of US troops – 8,398 plus a crew of 905 – and on 18th February 1942 sailed from Boston to Key West. Here Captain Bisset came aboard, replacing Captain Townley, who was retiring. Leaving Key West on 25th February, she sailed for Rio de Janeiro, then headed across the South Atlantic to Cape Town, arriving on 14th March. 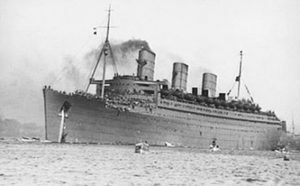 She finally arrived at Sydney on 28th March 1942: this later became known amongst the troops as the “Forty Days and Forty Nights Cruise”!